Natasha has a Bachelor of Arts degree in Nutrition from the College of St. Benedict in St. Joseph, Minnesota. She has received a Certificate of Training in adult weight management through the Academy of Nutrition and Dietetics. 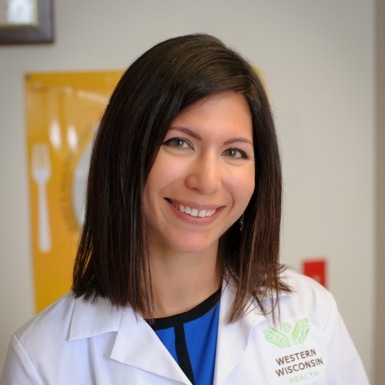 She has seen inpatients and outpatients for any nutrition-related issues such as diabetes, high cholesterol, hypertension, weight loss, celiac disease, autoimmune disease, food allergies/intolerances and gastrointestinal disorders at Western Wisconsin Health since 2008. She has a special interest in functional nutrition therapies and integrative health. Natasha also is the Director of Community Health Improvement and works to bring wellness programs and opportunities to patients, local school districts, and businesses to make our community a healthier place to live, work, and play!